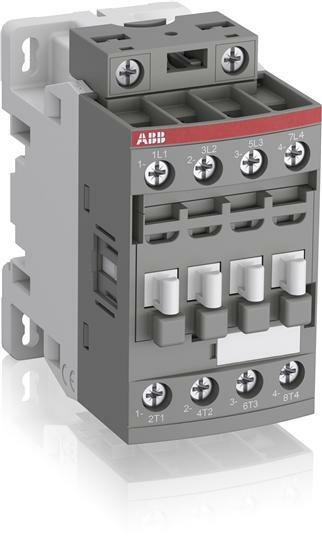 AF09 4-pole contactors are used for controlling power circuits up to 690 V AC and 440 V DC. They are mainly used for controlling non-inductive or slightly inductive loads (i.e. resistance furnaces...). AF... contactors include an electronic coil interface accepting a wide control voltage Uc min. ... Uc max. Only four coils cover control voltages between 24...500 V 50/60 Hz or 20...500 V DC. AF contactors can manage large control voltage variations. One coil can be used for different control voltages used worldwide without any coil change. AF contactors have built-in surge protection and do not require additional surge suppressors. The AF... series 4-pole contactors are of the block type design. - Main poles and auxiliary contact blocks: 4 N.O. main poles, front and side-mounted add-on auxiliary contact blocks (mechanically-linked auxiliary contacts compliant with Annex L of IEC 60947-5-1. N.C. mirror contacts compliant with Annex F of IEC 60947-4-1) - Control circuit: AC or DC operated - Accessories: a wide range of accessories is available. Note: - AF..-..-..-11 not suitable for a direct control by PLC-output. - AF..-..-..-11 type available in some countries: please consult your ABB representative.